Hydro-turbines often suffer damage caused by the presence of suspended sediment in the water flow. The solids hit the turbine components causing a removal of material from their surfaces, a phenomenon generally known as “hydro-abrasive erosion” (or “wear”). The issue is particularly relevant in world regions where rivers are seasonally or permanently rich in sediments, such as the Himalayas, the Andes, and the European Alps. The higher erosion risk is associated with fine particles, typically in the form of silt, which, unlike coarse solids, cannot be removed in an economically viable manner. 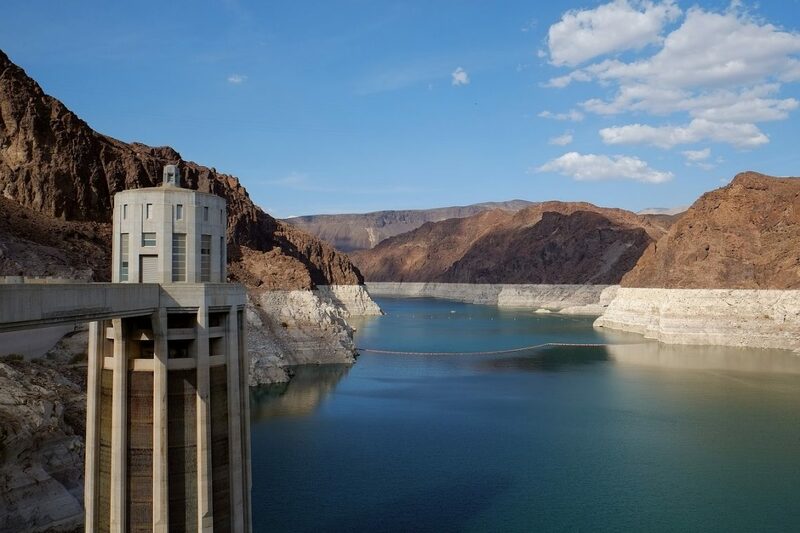 It is not surprising that the runner blades of hydro-turbines are highly vulnerable to erosion, but other parts of the device can also be seriously damaged. In the case of Pelton turbines, the injector is definitely worthy of attention. An injector serves a twofold purpose, namely, generating the high-speed jet that strikes the blades, and regulating the flow rate through a needle-nozzle system, thereby acting as a control valve. The particles carried along with the water flow are accelerated to a high velocity, resulting in a considerable erosive power that is finally released when they strike against the injector’s surfaces. Research work was carried out within the FluidLab research group at Politecnico di Milano concerning the Computational Fluid Dynamics (CFD) simulation of the hydro-abrasive wear of a Pelton turbine injector, with the goals of both gaining further insight into the physical process and building a reliable descriptive model which might be used by engineers for design and management improvement. The laboratory and computational facilities for erosion prediction of the FluidLab group (Credit: Gianandrea Vittorio Messa). The long-term expertise of the FluidLab group in the fluid dynamic characterization of flow control devices, as well as in the numerical and physical modeling of particle-laden flows, was a key to accomplishing the task in all its complexity. More generally, the FluidLab group deals with several topics in the field of fluid mechanics, which can be divided into three main areas, namely, industrial fluid mechanics, green energy, and fluid-structure interaction. 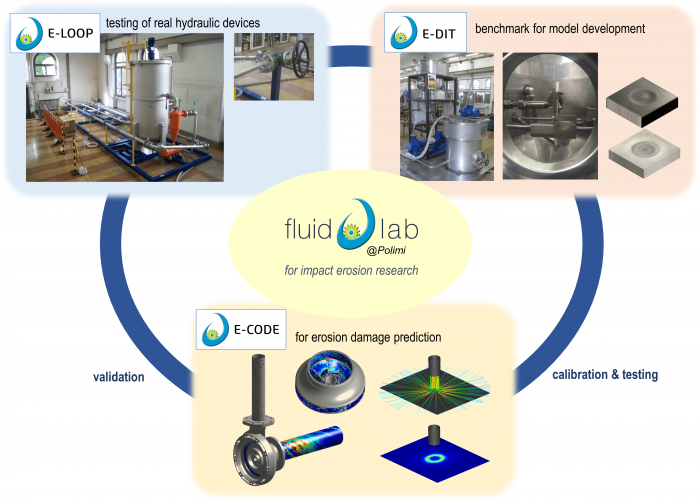 In relation to particle-laden flows, the group disposes of the following laboratory and computational facilities: the E-DIT (Direct Impact Test), in which the damage produced by a high-velocity slurry jet impinging against a specimen provides characterization of the wear behavior of materials under given testing conditions; the E-LOOP, for slurry erosion testing of pipeline fittings and hydraulic equipment; the E-CODE, a set of MATLAB libraries which, starting from the output of a CFD simulation, allow estimating the erosion produced by solid particles in the flow. Estimating the erosion of the injector was a particularly challenging problem because of its multidisciplinary nature, involving aspects related to both fluid and solid mechanics. On one hand, the accurate determination of the trajectories followed by the solid particles inside the injector was crucial for attaining reliable erosion estimates, thus requiring making use of advanced fluid dynamics models for describing the interactions between the travelling particles and the turbulent liquid flow, also accounting for the presence of the air surrounding the jet. On the other hand, once the trajectories have been calculated, the loss of material produced by the abrasive particles colliding against the injector surfaces had to be accurately quantified. This required employing specific models called “erosion models”. The erosion models are based on the concepts of damage and fracture mechanics, hence pertaining to the solid mechanics world. However, current practice often turns to empirical formulas obtained from calibrations of tests like those performed in the E-DIT. Clearly, this strongly limits the predictive capacity of the CFD models. In performing the numerical simulations, particular attention was paid to verifying the consistency of the solution, as well as assessing up to which extent the estimates were affected by the components of the CFD model of uncertain nature or difficult to quantify. Indeed, this is a distinctive feature of the research work carried out by the FluidLab group, whose researchers are convinced that the analyses described above are essential to the correct use of the CFD approach for engineering purposes. In this perspective, the wear of the injector was predicted by two different empirical erosion models, which yielded significantly different predictions although both being potentially applicable to the flow conditions of interest. Given this inherent uncertainty, and not disposing of experimental data, the researchers put a lot of effort in drawing reliable conclusions and, finally, they succeeded in identifying the injector components that were most vulnerable to the erosive wear, namely, the nozzle seat and the needle. Additionally, they explored how the actual opening of the injector affected its vulnerability to wear, observing that the damage to the needle, unlike that to the nozzle seat, was likely to increase very significantly as the valve was closing. The critical analysis of the obtained results, interpreted in light of the pertinent literature, allowed identifying possible directions for developing this research. First, limiting the inaccuracy inherent in the use of empirical erosion models should be limited, and, to this purpose, more reliable (but, at the same time, easy to handle) tools for predicting the wear process at a small scale are needed. Second, in order to procure a more accurate estimate of the damage, the synergy of cavitation and impact erosion should be accounted for, thereby requiring a model able to capture this effect. In addition to the availability of a technique capable in accounting for the dynamic evolution of the eroding geometry, this will open the way to the investigation of how the occurrence of erosion deteriorates the regulation performance of the injector. These findings are described in the article entitled Hydro-abrasive erosion in Pelton turbine injectors: A numerical study, recently published in the journal Renewable Energy (Renewable Energy 130 (2019) 474-488). This work was conducted by Gianandrea Vittorio Messa, Simone Mandelli, and Stefano Malavasi from DICA, Politecnico di Milano. For more information about the activities of the FluidLab group, please, refer to the website www.fluidlab.polimi.it or contact Stefano Malavasi (e-mail: stefano.malavasi@polimi.it), or Gianandrea Vittorio Messa (e-mail: gianandreavittorio.messa@polimi.it). Gianandrea Vittorio Messa currently works as Assistant Professor of Hydraulics at the Department of Civil and Environmental Engineering of Politecnico di Milano. His research interests include numerical and experimental modelling of multiphase flow in pipeline systems and related phenomena, such as slurry transport, impact erosion, and cavitation.